Big picture, little picture. The big picture involves trying to glimpse what God is doing in saving the whole creation from the powers of sin and death. The little picture involves how that salvation affects the lives of you and me, and how we as individuals and as a community of faith fit into what God is doing in saving the world. We see that big picture, little picture in today’s Gospel reading. The big picture is Satan, representing the powers of sin and death, tempting Jesus with control over all the kingdoms of this world. The little picture involves Jesus as just one human in the fight: After living the discipline of fasting for forty days, it’s one man, Jesus, resisting and defeating temptation. I want us to look at a little of both today: the big picture of Jesus saving the kingdoms of the world from Satan’s clutches, and the little picture that the salvation of all creation begins with the disciplined faith of one person — of Jesus. Let’s begin with the big picture. Satan has the nerve to show Jesus all the kingdoms of the world and to claim authority over them. Jesus’ response seems a bit surprising to me. He doesn’t flat out say, “No, Satan. You’re crazy. This world is God’s, not yours. Authority over these human kingdoms isn’t yours to give!” But Jesus doesn’t do that. Instead of denying Satan’s authority, he refuses to worship Satan as a means of gaining power over earthly kingdoms. Jesus simply says, “It is written, ‘Worship the Lord your God, and serve only him. '” Reading between the lines, I think Jesus is admitting that our human kingdoms are, in fact, under Satan’s authority. But Jesus isn’t about to redeem us and win back earthly kingdoms for God by worshiping Satan. He has a different plan to foil Satan’s game, and it involves dying on the cross. Big picture, little picture. You’ll find the same bulletin insert used on Ash Wednesday. One side tries to capture the big picture of God redeeming our human kingdoms. The other side invites each of us to take part in God’s ongoing work of salvation through the faith discipline of fasting — a good way to fight temptation. Looking at the top left diagram on the “Evolution of Religion”– the picture of a crowd of people pointing the finger of accusation at one person — we see Satan’s authority over human kingdoms. The name “Satan” in Hebrew is a title that means “The Accuser.” This illustration is the key to understanding how the powers of sin and death work here on earth. 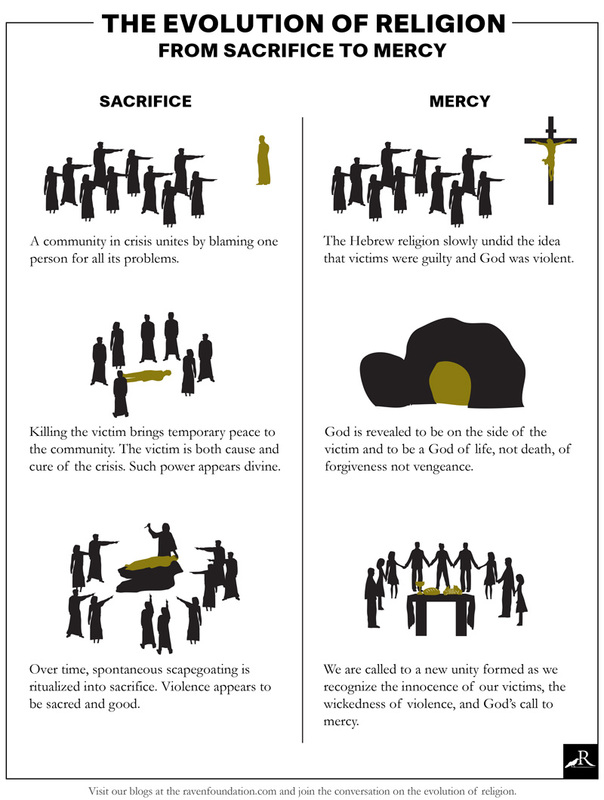 The community in crisis is depicted as accusing a scapegoat in order to bring peace to their larger community. That is why Satan, the Accuser, is depicted with authority over human kingdoms in our Gospel today. Jesus doesn’t challenge Satan’s claim, because Jesus knows the exact nature of Satan’s authority. So Jesus refuses to worship Satan and get caught up in the same game of accusation and condemnation. Instead, Jesus’ plan to begin undoing Satan’s reign is to himself become the victim of that accusation and condemnation so that God’s resurrection power of life can expose it. Satan’s greatest trick is to get us to think that God is in the business of accusation and condemnation. But the cross and empty tomb of Jesus reveals a God who is on the side of victims. God is a God of mercy, not condemnation. OK. That’s the big picture. Let’s look at the flip side of our insert and talk about the little picture of how we can find ways to fit into this large drama.